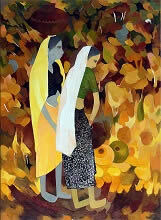 Shashikant Bane, a devoted painter belongs to Deorukh, Ratnagiri in Konkan. His childhood memories of the beauty of this region which is known an Parashuram - Bhumi, has created a nostalgia in his mind. His art-education at Kolhapur and then in Mumbai brought maturity to his love of landscape paintings. The guidance of the master paintings of Kolhapur like Ganpatrao Wadangekar, R. S. Gosavi and Ravindra Mestry enhanced his water colour rendering. The beauty of line and Indian Style figure of Datta Parulekar in Bandra school of Art, Mumbai, added strength to his figurative compositions. His nostalgic memories of Konkan landscape, his tour to Rajasthan and his study of paintings of N. S. Bendre, the famous master colorist resulted into the superb colour - orchestration and the indigenous quality of his paintings. The amalgams of the various experiences and experiments in the technical aspects and the presentation have brought a unique quality in his painting which attracts art - lovers as well as the laymen. Participated in various major Exhibitions, Group Shows and Art activities in India. Invited for the exhibition on celebration of the 50th Anniversary of India's Independence by Bombay Art Society. Working as an Art Teacher in Muncipal Corporation of Greater Mumbai and having his own Art Gallery - Krishnai, at Virar, Dist. Thane, Maharashtra. Mrs. Jill Nightingale, U. S. A.
Mr. Robert Horene, U. S. A.
Mr. K. Martin, U. S. A.
Mr. Kalyan Banerjee, United Phosphorus Ltd.
Mr. P. K. Pople, Oswal Wollen Mills Ltd.